Hi Toml, it does look like the rear toe setting was the main source of your handing woes as it should be about +0.10’, I reckon last time it was set the alignment operator couldn’t get it into spec due to the lowered springs giving excessive rear camber so, not knowing what he was doing, traded it with the toe setting to get the camber near enough. Yikes! My knowledge in the dark art of suspension is limited but from Porsche manual data the standard, M030 & X74 settings should all have a positive rake of 15mm (GT3 is adjustable), yours is 11mm so could do with a little more but that may also be affected by tyre size and wear so I’m not sure how much difference an extra 4mm of rake would be noticeable to the average road driver. My car currently has 295/35R18 tyres and if I change to 285/35 then the rear will sit 3mm lower anyway according to the maths. Having non height adjustable suspension I’m just going to add my 10mm perch spacers and adjustable toe arms and hope it aligns to X74 spec, that will be the time to stop delving any further as I’ll just tie myself (and wallet) in knots! Please post back any feedback once you’ve had your suspension done, thanks. If anyone is interested in knowing more about suspension then this is a great link, 4 part series on the basics and how handling is influenced by different factors. I’ve subscribed to his YouTube channel, the guy is a young genius. He built his own car in India to experiment with suspension setup and drives it illegally on the road, he then moved to Canada and got into modifying his AMG E55 Merc to race track it, he does all the engineering/rebuilds/fabricating and is now building a new race car chassis to swap all the E55 components to. He’s an excellent mechanic, engineer, teacher and lunatic. Check out his crash into a tuk tuk in India in his self made car and the police with machine guns! So when my car was at CG back in January they suggested perches to raise the rear. I think I will try and get hold of spring perches and have them fitted as a matter of course, saving paying for labour twice!! Did anyone already buy perches? Have a link? I couldn’t find anywhere to buy them for our car so I got some made up. I originally wanted them in Polyurethane but it was going to be too expensive to make in a low quantity so I got a machine shop to turn some up in aluminium. £25 for 2 + P&P. I measured them (from memory) as 51mm ID, 75mm OD and 10mm thick for my M030 shock absorbers. Don’t trust these dimensions measure your own! There could be an opportunity for our very own Alex Yates engineering to add another product to his 996 range as several folk seem to be having this issue. Just had an email reply from CG saying it’s possible to knock the old perches off the original dampers and place them on top of the perches on the Koni dampers to effectively double them up. Wish I had my car and parts with me so I could have a look see! Good point, I still have my old shockers so could use these if I ever need/want to go higher. 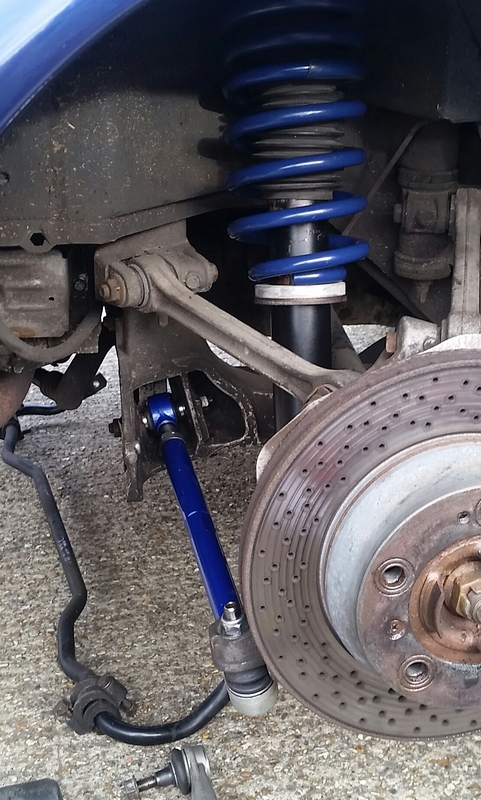 Just had a thought, if the -30mm aftermarket springs take the car too low for x74 geo and the m030 don't drop the car enough for some people and you don't want to do coil overs then isn't the answer to get X74 springs? Just checked the PET, they are on there.. Surely they would give a middle ground drop and allow x74 settings? Well I finally had some time to fit the 10mm spring spacers and adjustable toe arms this afternoon, alignment at another place tomorrow morning with more experienced technicians so hopefully no problems getting to X74 spec. Car squats less in the rear now with the spacers and has less of a slammed stance. Spacer below spring, it's a serendipitous coincidence that the springs and toe arm match the bodywork! I still need to sort mine. Geo done this morning and now finally set to X74 alignment, car felt nice and balanced on the greasy wet roads afterwards, a bit tail happy but that was down to the conditions. When there is a dry day I’ll measure the ride heights and see how they compare to X74 now that I’ve fitted the spacers so others will know what to expect on a 3.4 C2 with Eibach lowering springs. Sorry, just playing catch up. Where did you get the adjustable toe arms? Ned, see the link on page 1 in my first post - Hardrace arms £215, they seem really well made and fit perfectly. Are you still going the diy track rod end route Marky? Yep that's right or as I call it, going down the "blantantly copying Infrasilver" route. I've only got as far as buying the outer track rod ends so far. I'll be buying the inner end rose joints soon, then I'll look at the custom turnbuckles. The car won't see much use until the spring so I'm concentrating on other things at the moment. I'm looking to do the same in the spring/summer, there may well be a few others, perhaps we could get a group buy discount on the turnbuckles? Hi Toml, it does look like the rear toe setting was the main source of your handing woes as it should be about +0.10’, I reckon last time it was set the alignment operator couldn’t get it into spec due to the lowered springs giving excessive rear camber so, not knowing what he was doing, traded it with the toe setting to get the camber near enough............Please post back any feedback once you’ve had your suspension done, thanks. So I got my car back today. In the end I decided against spacing the rear for increased height and just went with what geo could be achieved. I'm much happier now that I actually have some toe in! The camber is a bit much so Matt maxed the negative camber at the front (-42', -43') to at least get a bit more balance between the axles. In future I might go for the increased height subframe bushes that Matt told me about, that will effectively raise the rear to reduce the camber, and we should still be able to keep the toe in spec. I'm hoping to get some made at work but won't know yet how feasible it is as we are at full capacity for at least the next few months. Alex Yates made Infra's for him for £30-£40 if I remember rightly, but he's too busy at the moment too. Material is £10 ish, plus I'd want them zinc passivated ideally, for protection, then I'll have to slip the young'un at work a few beer tokens as he'll be stopping back to machine them, so it'll be tough to come out at that price. I'll post up when I get nearer the time. The program will be saved for repeat batches (it's a 2 minute prog anyway) but I'm wary of supplying others as if they failed I'd be in trouble I imagine. Happy to risk myself but not others. I'll update soon but I doubt it'll be within the next 2 or 3 weeks unfortunately. Toml I think adjustable toe links will be easier than raising subframes and things and you'll have infinite adjustment after that for any future changes. . Just my 2p.